According to the official Back-on website, [ヒカリサスホウ FK Metal Ver.] 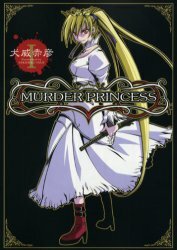 features in the latest ‘Murder Princess‘ OVA (original video animation) as its opening theme! Not knowing anything about the manga itself, it is undoubtedly a massive promotion prospect for Back-on, as it means they can reach an even larger audience! The DVD is set for release from March 28th 2007, and will be a 6-part series – each being released on a monthly basis. Some bonus footage will be included on the DVD’s. A special box to collect the entire series in will be offered. The original story serialized in Dengeki Teioh magazine which was suspended, and will pick back up from the April issue of Dengeki Daioh. Hikari Sasuhou definitely has to be one of my most favourite Back-on songs, so I will try and find out more about the manga.